Puritan’s Pride Retinol Cream is a very thick and heavy cream that doesn’t work well for sensitive skin. The texture and feeling of this cream is extremely thick and heavy, and leaves a greasy residue on the skin. From the second I applied it to my skin, I had a feeling it wouldn’t react well with my skin. Because of the super thick texture, you have to use a lot of this product to cover your entire face and neck. Not only that, but it comes in a jar which I don’t like because I hate having to stick my fingers into a product. I much prefer a pump. The morning after using this product for the first time, my face was covered in white heads and clogged pores. Because of the thick and greasy texture of this cream, it really broke out my skin. After using this product for a longer period of time, I continued to break out and experience clogged pores. Not only did it break out my skin, but I saw literally no difference in the fine lines and wrinkles on my face. Sometimes I am willing to put up with a little bit of clogged pores if it will help my skin with the fine lines and wrinkles. But unfortunately, I only saw negatives with this product… it didn’t help my skin at all. Overall, Puritan’s Pride Retinol Cream didn’t work for my skin at all, and I wouldn’t recommend this product to anyone with sensitive skin. Puritan’s Pride Retinol Cream has a very thick and greasy consistency; it feels extremely heavy on the skin. When I first applied it to my skin, it made my skin feel like it couldn’t breathe because of how thick and greasy it felt, which personally I really don’t like. Puritan’s Pride Retinol Cream comes in a jar which definitely isn’t my favorite, because I feel like it’s more germy to dip into a jar rather than pump out the product. Since the cream is so thick, it takes a lot of product to cover the whole face. I found myself dipping back into the jar multiple times to cover my entire face and neck. Puritan’s Pride Retinol Cream takes about 30 seconds to dry down, but when it does, it still leaves your face feeling sticky. The sticky and greasy feeling never goes away, and even when I went to bed I could feel the cream sticking to my pillow. Puritan’s Pride Retinol Cream has a very strong smell; it smells a bit like sunscreen and a bit floral, but also kind of smells like plastic. It’s definitely not a smell that I find pleasant at all. Unfortunately, after using this product for the first time, I woke up the next morning with very clogged pores. I noticed white heads all over my forehead and cheeks that had developed overnight. Over time, Puritan’s Pride Retinol Cream continued to break my skin out. I also noticed literally zero difference in any fine lines and wrinkles on my face. I found that this product was just much too heavy for skin, especially because it didn’t even help with anti-aging at all. Puritan’s Pride Retinol Cream has some interesting ingredients that could help with anti-aging and reducing fine lines and wrinkles including coconut oil, vitamin A, and vitamin E.
Coconut oil is known to help with anti-aging and retaining moisture because of the three fatty acids it contains. A lot of people consider coconut oil to be a miracle worker when it comes to the skin. Vitamin A, or retinol, is known to target fine lines and wrinkles and help reduce them by plumping and renewing the skin. Vitamin E works to help fight off free radicals from the skin which can help reverse damage and help further damage from occurring to the skin. These are great ingredients that when used in combination could have a powerful effect on anti-aging of the skin. 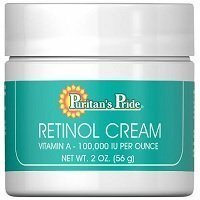 The cost of Puritan’s Pride Retinol Cream is $5.99 for 2 oz which comes out to $2.99 per oz. This is a very inexpensive price for a retinol cream. Unfortunately, I couldn’t find any money back guarantee for Puritan’s Pride Retinol Cream. To buy Puritan’s Pride Retinol Cream, click here. Ingredients Coconut oil helps with wrinkles because of its fatty acids.